New Item! 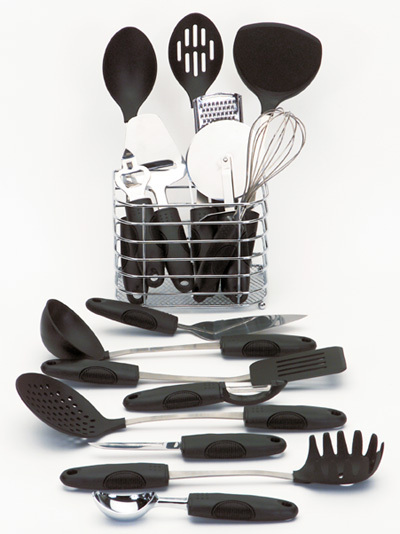 Our 17 Piece Kitchen Tool Set, with Specially Designed Wire Basket Holder. Excellent For Use With All Cookware. Makes a Great House Warming Gift, Engagement Party Gift, Bridal Shower Gift, Wedding Gift, Birthday Gift, Mother's Day Gift, Father's Day Gift, or a Gift for Yourself. And All Of These Tools Fit Into The Specially Designed Wire Storage Basket Which Is Also Included. Now where in the world, do you know where you can get that type of a warranty on such an inexpensive set of top quality kitchen tools or kitchen gadgets? HERE at AAWSALES, that's where! Most manufacturers give you a few weeks worth of warranty, but NOT US! If this product fails within the lifetime of the original purchaser, it will be repaired or replaced FREE! No home should be without our Chefmaster Kitchen Gadgets set.